The Aqua Design Women's Loose Fit Rash Guard Shirt is specifically designed to offer optimal performance in and around the water. The short sleeve design is perfect for warmer weather and is ideal for both active and casual water activities. While water sports enthusiasts will find this water shirt highly functional, we designed it to have a more relaxed fit than a traditional surfer "compression-fit" rash guard top with our four-way stretch fabric. It is made from 100% AquaPoly Microfiber fabric that is breathable, moisture wicking and rated UPF 50+ for maximum protection from the sun's harmful UV rays, whether it is sunny and warm, or cloudy and dreary. For added comfort, we used flatlock stitching which also makes the seams more durable and chafe-resistant. No matter how you like to spend your time in the water, this shirt will keep your skin safer and your body comfortable. Available in five fun 3-D water-print colors to perfectly match your personality and blend in with your watery environment, the Aqua Design Women's Short Sleeve Loose Fit Rash Guard Shirt perfectly coordinates with our entire product line of women's swim and activewear. In addition, our super comfy clothes are ultra-wicking and fast drying for a quick transition from water to land. Go from the water to the beach or the gym in ease and comfort. In addition, this is not your thin, low-quality rash guard. Sun exposure, concealment, and textile weight require a balance between optimized skin protection, modesty, and comfort. With Aqua Design's UPF 50+ lab-certified sun protection rating, you can be assured that our design team did not skimp on cheap low-tech material. We leveraged the best technology to design a breathable, fast-drying fabric that feels nice so you can spend your time outdoors without worrying about burning, being self-conscious, or uncomfortable. Wash cold and cool dryer or line dry. Follow care instructions and fabric should not shrink. X-SMALL THROUGH CURVY PLUS-SIZED: To fit every woman with a figure-flattering option. Four-way stretch fabric adds comfort for unrestricted movement.Swim Athletic shirts in relaxed fit XS, S, M, L, XL, 2XL, 3XL, 4XL, 5XL, 6XL. Use the size chart to make your selection. 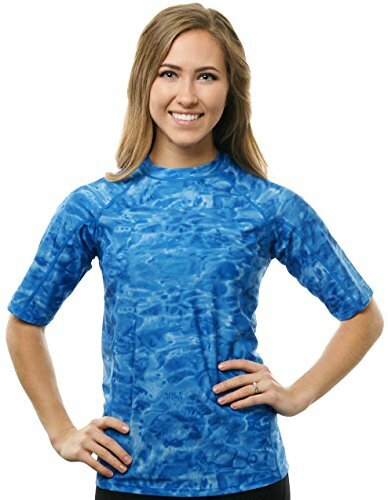 VISUALLY SLIMMING WATER-RIPPLE CAMOUFLAGE PATTERN: Available in five distinctive water-inspired colors, the attractive and unique aqua pattern rash guard smooths, blends and conceals curves in a form-flattering, comfort-fit design.This short sleeve sun protective top hugs your body with a comfortable solution between "compression fit" and a "loose fit". UPF SUN PROTECTION & DIVE SHIELD: Unlike SPF rating for lotions that must be reapplied, our fabric has been tested and certified by an independent US lab to be UPF 50+, the maximum rating for all day protection. Protection of harmful UVA and UVB sun rays is vital, even in overcast skies. But so is guarding against painful jellyfish stings. Aqua Design rash guards provide a protective barrier from both. Be confident with effective UV protection. EASY CARE: 100% Aquapoly (85% Microtwist Polyester/15% Spandex) fabric is soft, quick-drying and machine washable. Wash cold and cool dryer or hang dry. COORDINATING SWIM & ACTIVEWEAR: Coordinates with Aqua Design's entire line of water-inspired women's swim and activewear. Mix and match to create your own two-piece swimsuit. Please check our storefront by clicking "Aqua Design" above the title to see all women's performance clothing in various water pattern colors. If you have any questions about this product by Aqua Design, contact us by completing and submitting the form below. If you are looking for a specif part number, please include it with your message.